Spaghetti Legs is 3 and still has a cot in his bedroom. There, I said it. He hasn’t moved up to a big boy bed yet because quite frankly, he’s decided that he’d rather lie diagonally across my face in bed with me. To entice him back to his own room, I’ve been working on a mini makeover that doesn’t involve redecorating or a major overhaul – just some appealing new additions to make it inviting and not babyish. As a result of the accidental co-sleeping, I dragged my feet for ages over buying him a bigger bed. I rather feel like that it’s now too late for toddler beds and we should go straight to a single bed for him, but the dimensions of his room have made it tricky to find a reasonably priced bed that’ll fit. Finally, a plain white one was settled on, with vehicle themed bedding to match his curtains, and a Bounce Back duvet with matching pillow from Sleep & Beyond. 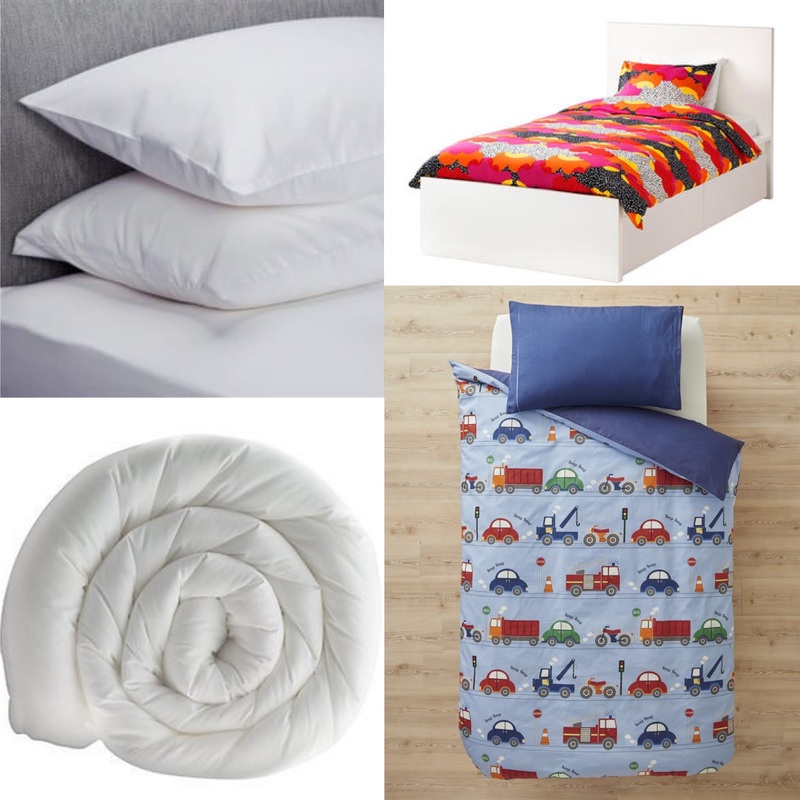 I make no secret of the fact that I hate shopping, so I like anything that I can order from the comfort of my own home – and I was made up to get a machine washable duvet that’s a good price. It’s got an anti-bacterial filling to inhibit yucky stuff growing inside and after some of the stories I’ve heard from other parents I decided this was the perfect choice for my low grossness tolerance. My own preferences aside, the duvet is anti allergy which can only be a good thing; whenever Spaghetti Legs gets a cold it goes to his chest and although he doesn’t officially have any dust allergies I do worry about his chest so I thought something to combat potential dust mites too would be ideal. I couldn’t resist these battery-operated Pom Pom fairy lights from Next to drape along his headboard for a cosy bedtime and I know he’ll be excited to see them. I went for multi-coloured lights because although I do tend to dress him in blue most of the time, we do try and promote that idea that there’s no such thing as boys’ colours or girls’ colours. And besides, monochrome rooms might be very trendy but I can’t quite pull off the Pinterest look, and you can’t beat bright colours when you’re three and a half, can you? Despite sleeping soundly in relative darkness throughout babyhood, like many 3 year olds he’s now grown to equate darkness with scariness. 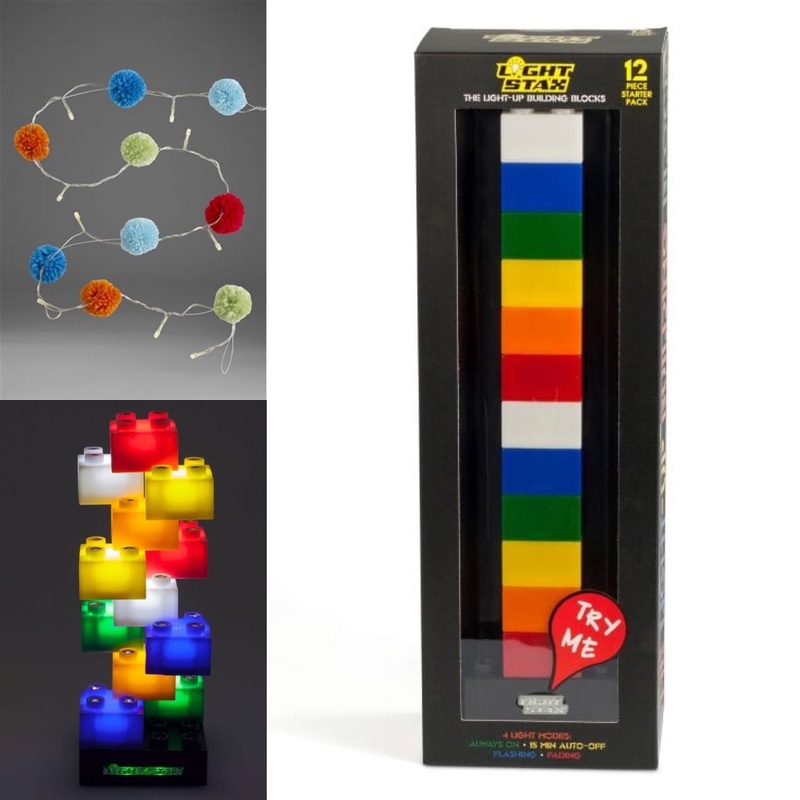 He likes to leave the landing light on, whereas I don’t like that much light shining into my own room, so an additional nightlight is perfect – and the block design of this LED Light Stax from Find Me A Gift is perfect for my building-mad kid. When my son first moved into his room at the grand old age of 18 months (nothing says apron strings like an extended stay in your parents room does it!) it was decorated with handmade curtains, and lots of colourful toys and books, but very little in the way of actual wall decoration save for some framed prints on a picture shelf. So to get him involved in adding some decoration to his room (and remind him that his room actually exists) I’ve got hold of some monster themed wall stickers from Find Me A Gift that we are going to attempt to apply together – wish me luck! 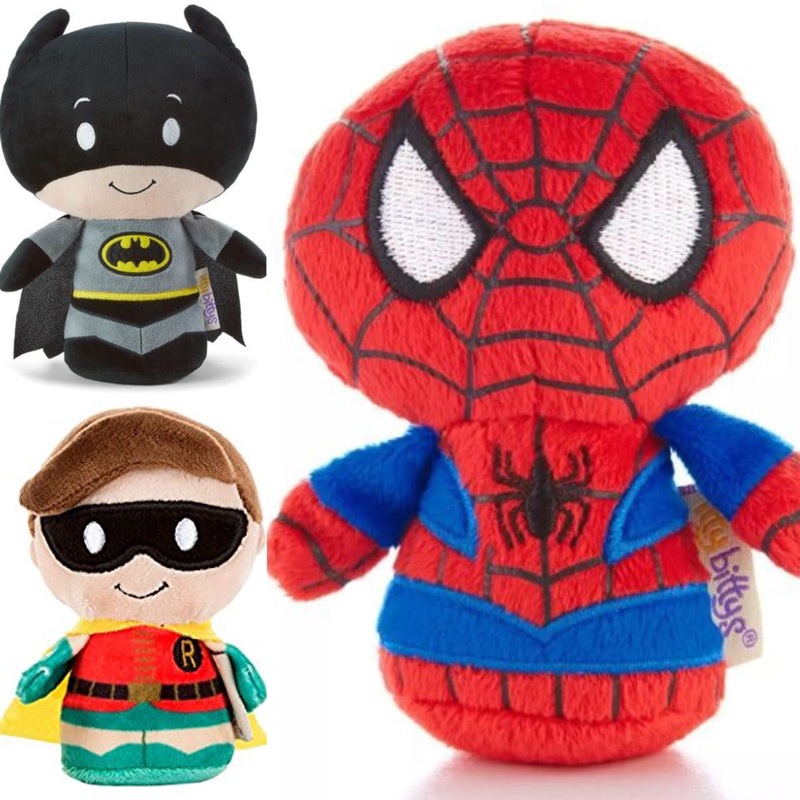 Adding to the already well established collection of Itty Bittys, we welcomed Spider-Man, Batman and Robin to the superhero fold alongside Star Wars characters, Wonder Woman, Superman, Iron Man and the Hulk. Our local Hallmark shop has unfortunately stopped selling them, but that’s not the end of the world – it stops him from asking for a new one every time we go in, and I can still buy Itty Bittys online. I’ve got a feeling Father Christmas will be bringing some more as stocking fillers in a few months time, too. As well as some new pyjamas, he’s now got a snuggly Yoda Dressing Gown from Find Me A Gift to look forward to in his new slightly-more-grown-up bedroom. He’s a big fan of Yoda, it being his first ever (and best) fancy dress costume that gets lots of compliments whenever he goes anywhere in it. But the entire outfit (which includes one of my old cardigans and belts) isn’t exactly practical for everyday use, so the dressing gown is much more convenient for a little Jedi’s bedtime! So, without entirely breaking the bank – and certainly without having to do any serious DIY – I hope that the mini makeover on Spaghetti Legs’ room is enough to persuade him to move back in there. I’ll report back on how successful the finished product was!